Yesterday the rocket interface disc, RID, finally arrived. This is the piece that actually mounts the free-flying unit, FFU, to the rocket. The custom made wave spring that will eject the FFU arrived a couple of weeks ago, and now we could finally mate them together. However it soon became apparent that the spring had a tighter fit in the spring gully than we had expected, and to determine whether this would affect the ejection or not me and Mikko carried out some spring testing. Soon half of the team had gathered around to watch and help out as we covered a sturdy table down in the workshop with foam and devised a clever way of holding the bottom plate of the FFU down against the spring. An unlucky Mario was selected sit under the table and cut a rope going down through a hole in the bottom plate and rid, and down through the table where it was hooked up to a tightening mechanism. To document the ejection we borrowed a Casio high-speed camera from the department of mechanics. We did two “launches” today, and while the launches weren’t as straight as they could have been the results seem positive, especially since the weighted-down bottom plate was not perfectly balanced. 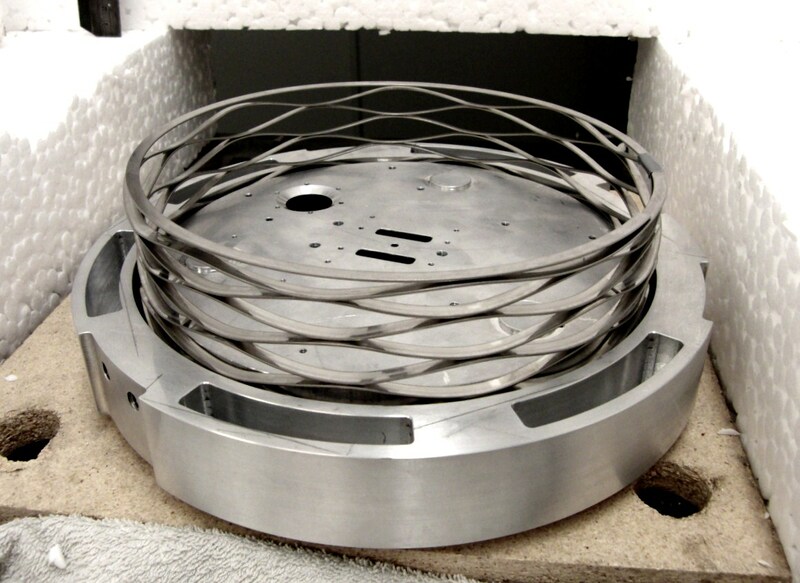 However, since the radius of the spring is slightly lower than expected the very top part of it easily gets jammed between the bottom plate of the FFU and the RID. More testing will be done soon, but until then enjoy the fancy high-speed videos! Sorry for not having turned them right way up, but this would decrease the video quality. During the past week we’ve finally done some real progress on the SCALE system . For those of you who are not totally up to date with that the SCALE system is please check out these posts. To make a long story short, the SCALE system is probably the most central part of the whole experiment, it’s a complex mechanical structure which has one task, to deploy and retract the spherical probes which are used to make the measurements of the electromagnetic field. Due to the drastic changes we had to perform on the landing system the SCALE system where somewhat overseen and tasks which should had been performed much earlier during the project still remained when the team gathered after the summer. However due to great efforts performed by mainly Malin and Mario the system is now finally running and we now focus on optimizing the functionality of it. Below are two videos which displays the system and how it works. Last Thursday it was time to determine once and for all how much the parachutes we use in the landing system could handle. Having failed to break them in both the car towing test and the actual drop test, me and our supervisor Gunnar Tibert resorted to more brutal methods. One of the 70″ parachutes was hung upside down from a hook in the Structures Lab at KTH, supported by a single line of paracord which was to brake the fall. This is the same type of cord that was successfully used in the drop tests above Esrange. The parachute was loaded with about 19 kg of extra load, and dropped with 1.5 m of slack paracord. Sometimes it's best to use what you have closest at hand! 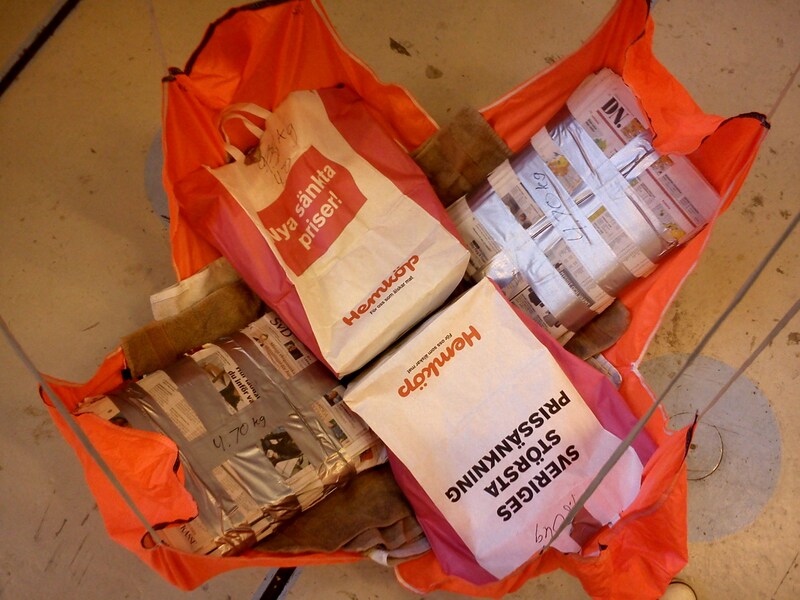 19 kg of old newspapers have just the right density to fill out the parachute nicely. View from the hook of the crane, filmed with the GoPro HD Hero. 420 FPS high speed footage shot using a Casio consumer camera. This doesn’t show the paracord breaking, but is cool nontheless! Right now we’re trying to determine the speed right before and after the line broke so we can calculate the force in the cord. At any rate, it is likely we will switch this cord for the real system to be sure that the same won’t happen during our flight! However, the cord still needs to be flexible so the shock to the experiment isn’t too great.